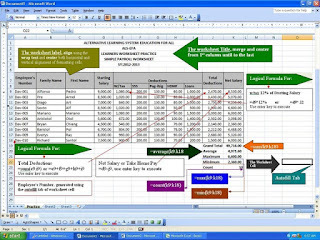 Another simple application of MS-Excel 2007 is how to create a payroll worksheet with a complete description of logical formulas to calculate the worksheet data. 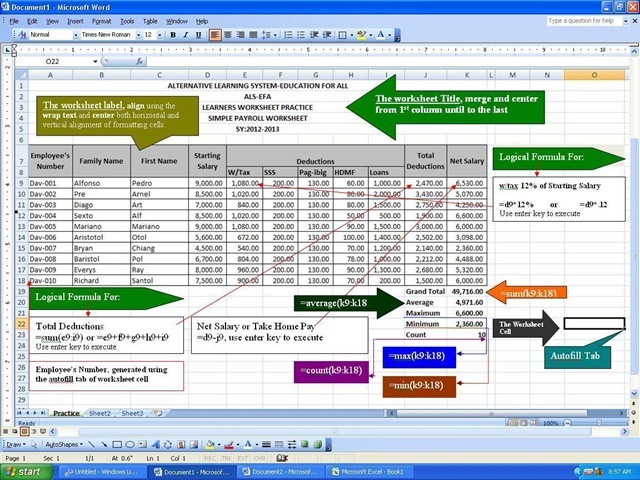 Previously, I was posted how to create a worksheet table using the MS-Excel 2007, now it's just easy to create this table for this application called “simple payroll”. This is a simple operation using the logical operator. You need only the basic knowledge in using the MS-excel. Now, this worksheet composed of the worksheet title, worksheet table compose also a label with a complete list of data by using the columns individually. And I use the auto fill tab of the worksheet cell to generate the employee’s number. Remember that this worksheet only is just an example or a worksheet practice table of my own. And this is not related to the worksheet title stated above. Now,I put the different parts and the logical formula inside of the autoshape that I’ve been use.So, I will clarify individually so that you will understand very clearly how to make this simple worksheet. 1. 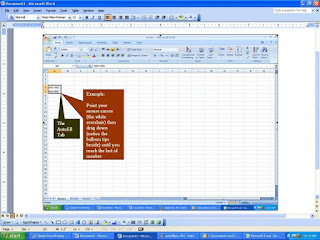 Worksheet Title- this is just located above the worksheet,commonly type in the column A row 1.The most common application is the merge and center along the worksheet table area.Remember that if there are one or more than worksheet title or subtitle.You cannot merge and center it, if you highlight all the preceding data in different rows.Example if you highlight the A1 and A2 with both data of your worksheets it will not execute.A popup window will appear and it would says “The selection contains a multiple values.Merging into one cell well keep the upper-left most data only”. How to merge and center? highlight the worksheet title from the 1st column until to the last column used by your worksheet table. 2. Worksheet Label- next of the worksheet title,this the top of the worksheet table.These are the head of the column as its have a name individually.The most common application here is the wrap text along the columns and the row using the formatting cells dialogue box. 3. Logical formula how to get the withholding Tax(w/tax)- this is use to calculate the withholding tax versus the starting salary using the percentage symbol.see the image above,click it to enlarge. =sum is the logical function name,e9 is the 1st ref.data,i9 is the last ref.data.You need to enclose the reference data and use colon to calculate from 1st ref. data up to last ref. data.Use other formula using the logical operator + by adding the preceding columns of data.See the image above,click it to enlarge. 5. Net Salary- this is use to find the take home pay of the employee using the logical operator minus –.this will minus to the starting versus the total deduction.See the image above,click it to enlarge. 6. Grand Total- use to find the total amount of the entire rows in single column of the worksheet.With compose of multiple data inside.See the image above,click it to enlarge. 7. Autofill Tab- located along the worksheet cell,position right side bottom.This is use to apply or execute automatically the preceeding data to be calculated using the drag of mouse(pointer)after highlighting the one or more data.See the image above,click it to enlarge.